Serrano was born in Córdoba, Spain in 1935. At the age of 9, he studied guitar with his father, Antonio del Lunar, a professional guitarist. Serrano made his professional debut at age 13, and soon earned a reputation throughout Spain and Europe as a gifted musician. 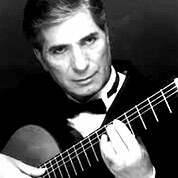 Dr. Juan Serrano is a flamenco guitarist who has played concerts and made recordings throughout the world. Flamenco. 219 bars. 16 pages. Time Signature: 3/4. key of a minor. Rasgueado.